A student grade instrument built for durability and looks. A medium large .460 bore and 5" bell provide the foundation for the classic cornet sound. Equipped with Monel pistons, the smooth action will make playing a breeze. The silver plated finish will provide excellent sound projection in any setting. 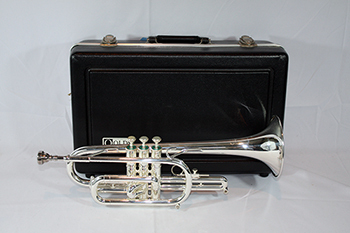 Another great silver plated cornet without the thumb saddle. Own it today and enjoy a 36% saving.